Children will use art tools to make a craft. Children will develop hand/eye coordination. Children will develop fine motor skills. You are proud of the things that your children have accomplished and learned during the past year. Let them make these crafts to help them feel even more special. Cut an 8-inch by 8-inch piece of poster board and a strip of poster board about two feet by three inches (long enough to fit around a child’s head). Cut a series of v-shapes along one edge of the length of the strip and then fold the strip in half. Form the strip into a circle, adjust strip to fit child’s head, and staple or glue together. Glue the hatband to the 8-inch-by-8-inch square cut out. Make a tassel by winding yarn around a 6-inch piece of cardboard. Tie a piece of yarn around one end of the wrapped yarn, leaving a length of yarn. Attach the tassel to the hat with a brass fastener. 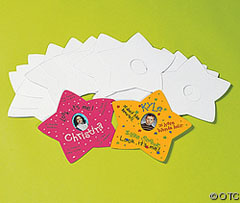 Let children personalize their graduation cap with glitter, crayons and markers, and stickers. Glue a plastic or paper bowl to poster board square instead of the headband strip. Cut an eggcup from an egg carton and a four-inch-by-four-inch piece of cardboard. Paint the eggcup and one side of the cardboard square (school colors if desired). Let dry and then paint the other side of the cardboard square. Let dry. Put a dab of glue in the center of the cardboard square and lay eggcup on top of the glue with the opening of the eggcup facing up. Let dry. 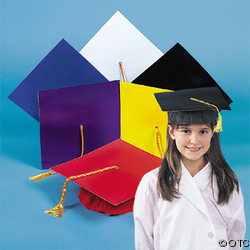 Make a yarn tassel and glue to the center of the cardboard square. 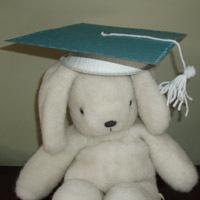 Use these cute miniature graduation caps as party favors or to hold small goodies. Make a line of glue on a paper towel roll and wrap a sheet of white paper and wrap tightly around it. Approximately two inches from the end of the paper, make another line of glue. Adhere the paper to the roll. Don't glue all the way to the edge of the paper as you want to give the illusion that it can unroll. Tie the scroll with a thin gold ribbon and tassel made of yarn. Decorate the diploma with the graduation year. That is the best that I can do.